Why Do Dogs Eat Their Poop/Feces? 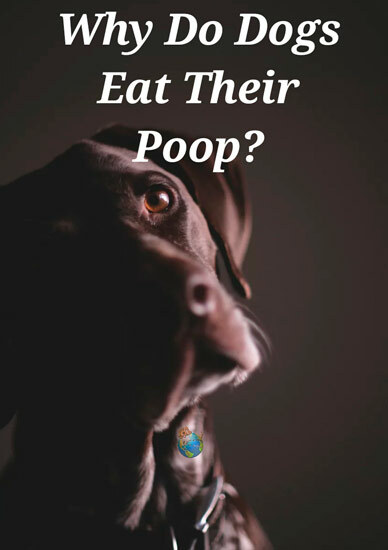 Ever wonder why your dog eats his or her poop? Well there is actually a name for the consumption of feces, coprophagia. Actually, many species practice coprophagia, including pigs, elephants, and hamsters. Although this is a highly under-researched topic, there are several hypothesized reasons why dogs eat their own feces. There are two main categories of reasons as to why dogs eat their own feces: physical/health problems and behavioral or environmental needs. Dogs may consume their own feces to compensate for physical needs such as starvation, malabsorption of necessary nutrients, and insufficient organ functioning. If a dog is put into a neglectful environment where they are starving they will go into scavenger mode. They will smell their feces for any undigested foods that they can eat. If certain organs in a dog’s body are not functioning properly it may lead to malabsorption of certain nutrients that are essential to a dog. Malabsorption is the in ability to absorb certain sugars, fats, proteins, and vitamins from food. Many of these nutrients are vital and further health issues could arise if the dog continuously lacks these nutrients. Your dog may eat their feces to try and consume the nutrients they are lacking. There are many diseases that may cause malabsorption, which is why your dog should be checked out by a veterinarian. Dogs may also consume their own feces for environmental or behavioral needs such as attention and anxiety. A dog may have been punished in the past after relieving him or herself in the house. This punishment may have lead to anxiety, depending on the severity. If the dog were to ever accidentally go in the house again, they may try to eat their feces to get rid of the “evidence”. It has also been observed that dogs may eat their feces when they are in a crowded area. It is uncommon for dogs to relieve themselves in the same area that they sleep, but if they are stuck in a crate all day they may have no choice. Dogs may also like the attention that they get from their owners when they do something bad. Of course owners don’t like to see their dog eating their own feces so they may raise their voice or move them away from the poop, which is a form of attention to the dog. Dogs may also eat their own feces to clear their scent from predators if they are in a threatening environment. There are a few methods you can try to get your dog to stop eating his or her feces. Keep your dog entertained and well exercised. Bored or neglected dogs tend to get into trouble or seek attention. Reward your dog’s positive behavior (not eating poop) instead of only focusing on bad behavior (eating poop). If your dog isn’t desperate for any sort of attention (positive or negative) you can try negative association by using a training collar. Every time they go to eat their poop you can tug at the collar. Some veterinarians suggest putting pineapple, spinach, or garlic (about a tablespoon) in your dog’s food because apparently it gives off a nasty taste in their feces. Most dogs eventually grow out of eating their poop if it is due to a behavioral issue. If you think your dog is eating his or her poop because of a health issue then you should seek treatment from a veterinarian as soon as possible.